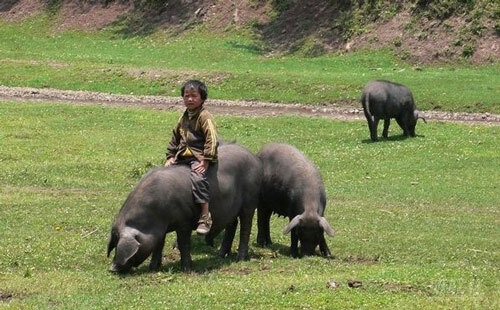 Kele Pigs are from Southwest China in the Yunnan-Guizhou mountainous areas, where the altitude is between 1700 to 2400 m, the climate is dry and cold during the winter, and humid in summer, and characterized by erratic changes in weather. Kele pigs have exceptionally thick back fat (5.1 to 7.2 cm) most likely because these pigs are bred for extra fat, since people in mountainous areas have a special demand for fat in their diet. Kele Pigs generally have a arched back and loin, long straight snout, narrow chest, wrinkled hind legs, strong feet, and light body. Also they are relatively low in prolificacy, with a litter size about 7 to 8 and 5 to 6 pairs of teats.